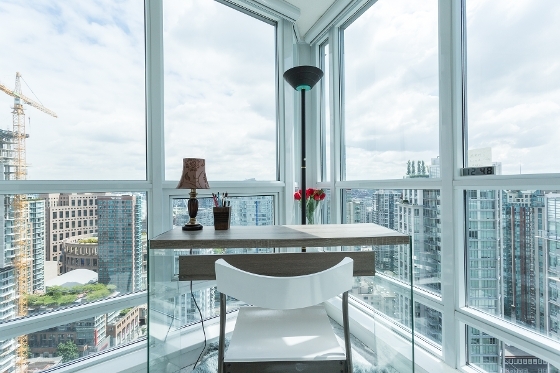 I am proud to present this luxurious one bedroom apartment withh amazing views of the city with South East exposure in the heart of downtown Vancouver. Floor to ceiling windows and white marble flooring, gourmet kitchen with a gas range cook-top, granite counter tops & stainless steel appliances and a spa inspired bathroom all with high end finishing's. Close to the Orpheum, shops, restaurants, transit and the enterainment district. This luxurious one bedroom includes a flex room, in-suite laundry, and one underground parking, concierge servie, fitness centre, media room & four high speek elevators. An ideal home for the young professional or investor in a highly sought after building. For a private viewing contact Carmen Leal at 604-218-4846.